It sounds like these should have beer in them, doesn’t it? Well, the original version from Baked bakery in Brooklyn is made with brewer’s malt blended with chocolate that’s swirled into the dough. In the book Baked , the recipe was adapted for home bakers to use malted milk powder and chocolate malted milk balls instead. 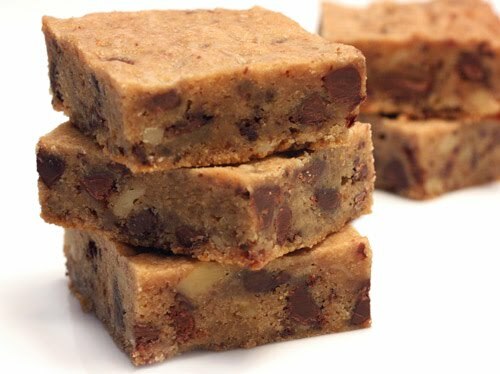 These are flavor-packed blondies with chocolate chips and toasted walnuts included as well. It’s suggested that they be served warm with a scoop of ice cream, and that’s a very good idea. I chilled them to make them easier to cut, and I might have tasted a bit while cutting. It was for research purposes, though, to confirm the ideal serving temperature. Yes, room temperature or warm is better for serving than cold in this case. The chocolate and malt aren’t as rich-tasting when cold. 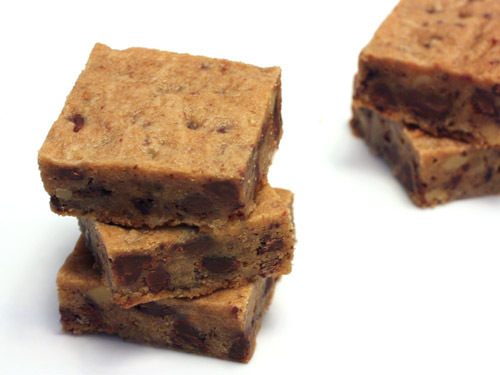 These blondies taste like a chocolate chip cookie in bar form, but that would be a chunky, malted, rich, and very special chocolate chip cookie. For the chocolate malted milk balls, you are instructed to coarsely chop them in a food processor. That results in some biggish pieces, tiny pieces, and some powder. Since only three quarters of a cup is used, I might quarter them by hand next time. It will be tedious, but I think the uniform chunks would be better in the blondies. To start, flour was sifted with baking powder, salt, and malted milk powder. Then, butter was creamed with brown sugar, eggs and vanilla were added, and the flour mixtures was slowly added to form the dough. 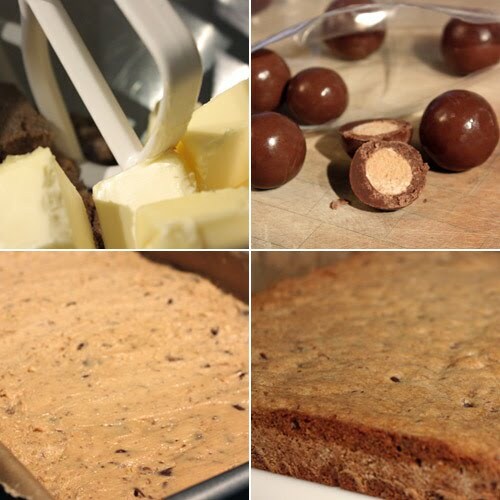 The chopped malted milk balls, chocolate chips, and chopped walnuts were folded in to finish it. The dough was spread into a parchment-lined baking pan and spread evenly. It baked for 25 minutes, it cooled on a rack, and then I refrigerated it overnight. I always fall for the flavor of malted milk, but with everything going on with these blondies they’re hard not to like. I took these cookie bars to a birthday party so they weren’t left sitting around the house tempting me. That does mean I’ll have to make them again so I can go ahead and cut them while warm from the oven to enjoy with scoops of ice cream. These look absolutely heavenly... And I don't even have a sweet tooth! Blondies with maltezers sound very tempting. This is simply irresistible blondies. these are beauties!!! I imagine they must be heavenly tasting, warm with ice cream, like you're mentioning!!! such a great treat. I love the malted twist on these blondies. I bet it infuses such a great flavor into them! Perfect with some vanilla bean ice cream. And the precicse mix of ingredients is.....? Anonymous: As I've stated before, I don't re-print copyrighted recipes from books without the publisher's permission. I do provide links to the books that I use, and when the recipe is from an online source, I link to that. Wow those blondies sound GORGEOUS! And they look so simple yet sophisticated and delicious. I'm swooning, just thinking about the wonderful textures in there! I like the idea of using the chocolate malted milk balls! And the crisp of the milk balls for the added texture to brownies...ooh la la! Waw,Lisa!! these malted blondies look like the real thing! Maltesers in a blondie!! what a neat & great idea! What a treat, I love the idea of malted milk balls in my blondies! I would like to take this opportunity to say that I and my appetite are always ready to help with any 'research purposes' required to assure that your recipes are at their optimum. And I do not limit my services to blondies and other sweet treats - savory dishes are all so welcome. Thank you. Send some of these blondies over! The lengths to which you'll go for the purposes of research? It's admirable. And it's also very good to know that these are better warm. Malted milk balls are one of my favorite candies and I buy some every trip home - and bring some back to France. I love blondies but with Malted Milk Balls they are heaven! Fabulous and I want them! I wouldn't be able to leave them around my house either or I'd eat them all. Wow. This gives me a reason to buy Baked. I tried a malted cookie recipe from Dorie Greenspan's book and was oddly disappointed. Maybe this will do it! So thoughtful of you to taste test the temperature for your guests. I'm thoughtful that way too. Sounds like a fabulous bar cookie. wow those are some perfect cookies. Looks absolutely delicious. Mmm, these look addicting! I just realized that I like malt flavors so maybe I'll make these! The blondies look truly delicious! Love those chocolate balls...and the blondies sound awesome! I love malted anything :) These look delish! Very interesting recipe! Love the addition of chocolate malted milk balls! It took me a long time to like chocolate malted milk balls, but now I think they are awesome. Love them in these blondies!